MANILA - The Philippines' Angelia Ong was named the 2015 Miss Earth in a coronation night held at the Marx Halle in Vienna, Austria on Sunday, marking the first time in the pageant's nearly 15-year history that a country has won back-to-back titles. The 24-year-old Ong, who beat more than 80 other national delegates, succeeded Filipina beauty queen Jamie Herrel, who earned the title in 2014. She is the country's third representative to have won the crown, the other being Karla Henry back in 2008. Ong is a marketing management student at De La Salle-College of Saint Benilde in Manila. In an earlier press conference held before she left for Austria, Ong said that she hopes to win the title so that she could participate in the United Nations Climate Change Conference in Paris, which began last November 30 and will run until December 11. In her Miss Earth profile page, Ong said: "I chose to continue the advocacy I started when I was just a candidate for Miss Philippines Earth." "These were Restoration, Reforestation, minimizing carbon footprints and taking 5R (Rethink, Reuse, Reduce, Recycle, Respect) by heart which brings me to a campaign I call #WEWILLBECAUSEWECAN." "This campaign aims to inspire and educate people on how they can contribute in helping the environment in their own little ways and even through social media." "Getting the campaigns online is a strategy to get the message out there and create more awareness. Awareness or identifying the problem is the first step in solving the problem." "We have to educate people about the threats of Climate Change because it is only through an educated society can true reform be achieved." 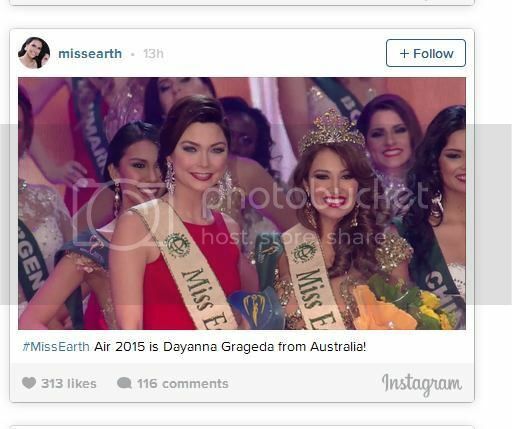 The Miss Earth 2015 pageant will be aired on ABS-CBN Sunday morning, before noontime show "ASAP 20." Angelia Ong, the Philippines’ bet for Miss Earth 2015, bagged the crown which resulted to a back-to-back victory after succeeding another country’s pride Jamie Herrell, Miss Earth 2014. 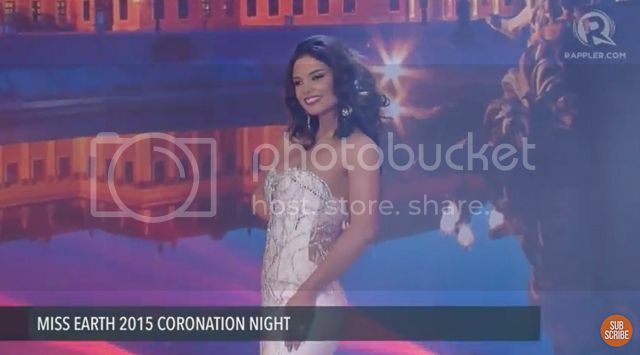 During the pageant’s coronation night held Saturday, December 5 (early morning Sunday, December 6 in Manila) which was held in Vienna, Austria, Ong bested 85 other ladies for the coveted crown. “I want to let everybody know that all things are possible and all things are feasible if we work together. We will, because we can,” she further explained. The other equally lovely and smart ladies who made it as runners-up include the following: Miss Earth Air-Australia’s Dayana Grageda, Miss Earth Water-USA’s Britanny Ann Payne, and Miss Earth Fire-Brazil’s Thiessa Sickert. Miss Earth is celebrating its 15th year this 2015, and this is the pageant’s first time to hold the coronation in Europe. The newly-crowned Filipina beauty queen is a marketing management student at De La Salle-College of Saint Benilde in Manila. In an earlier report published by ABS-CBN, Ong said that she hopes to win the title so that she could participate in the United Nations Climate Change Conference in Paris, which began last November 30 and will run until December 11. “This campaign aims to inspire and educate people on how they can contribute in helping the environment in their own little ways and even through social media,” she noted earlier; as she added that getting the campaigns online is a strategy to get the message out there and create more awareness. “We have to educate people about the threats of Climate Change because it is only through an educated society can true reform be achieved,” Ong disclosed. 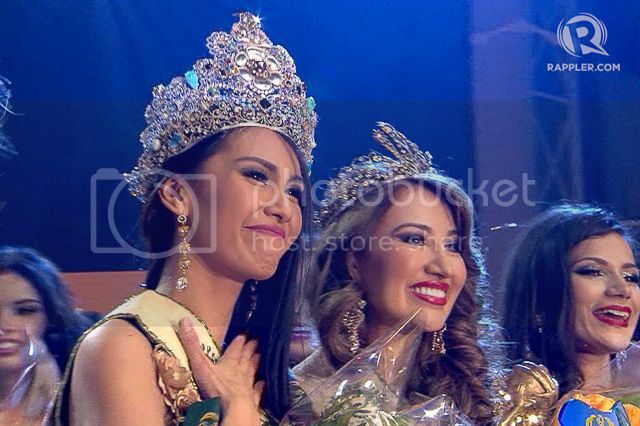 It was an emotional night, but Angelia and Jamie were all smiles as the crown was passed from one Miss Philippines to another at the Marx Halle in Vienna, Austria. Let's have a look at some photos from that night. See Angelia's reaction change in every shot – from shock to jubilation. 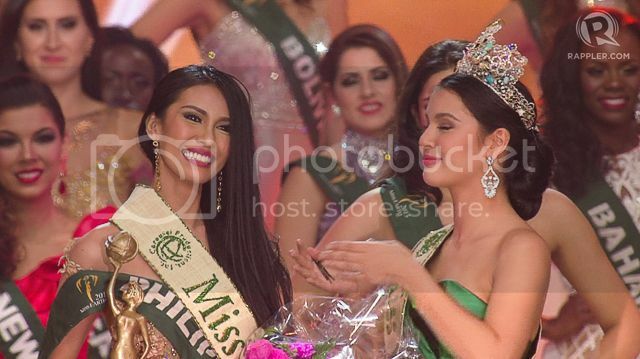 There's a lovely moment shared with 2014 winner Jamie Herrell as both Filipinos embrace each other in joy. 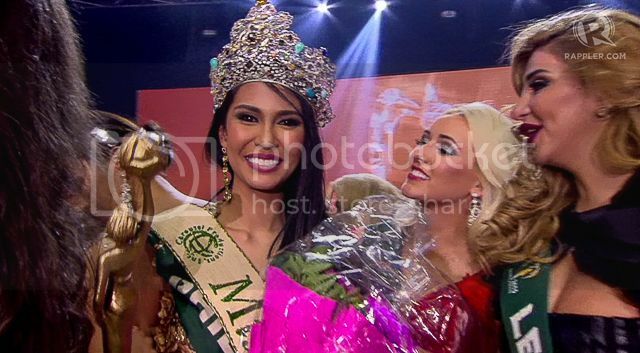 MANILA, Philippines – The Philippines' Angelia Ong was crowned Miss Earth 2015 at the pageant's grand coronation night on December 5 at the Marx Halle in Vienna, Austria. 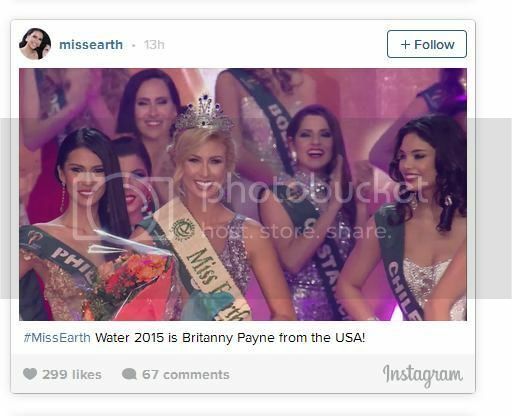 This is the second year in a row that the Philippines has won the Miss Earth pageant. Special awards were also announced during the night. 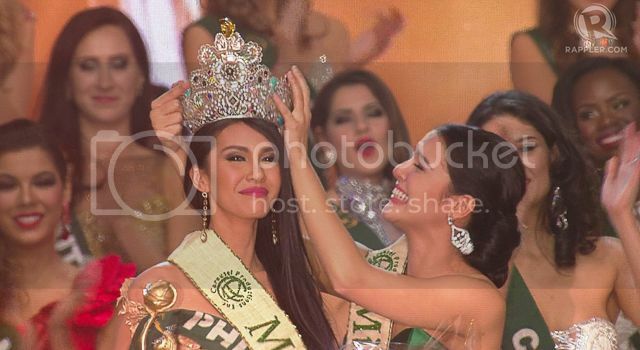 Reigning queen Jamie Herrell, also from the Philippines, crowned her successor after an emotional turn on the stage. The pageant is also celebrating its 15th year, and this is the pageant's first time to hold the coronation in Europe. Angelia beat out 85 other ladies for the crown. The evening began with an upbeat number from the 86 candidates, dressed in matching pink and white ensembles with each lady taking turns introducing themselves to the public in groups. Earlier, there was a video spiel about what they ladies stood for as a group – the protection and preservation of our environment. 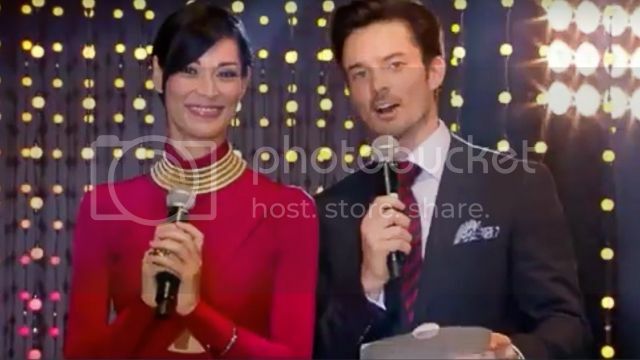 Hosts Joey Mead King and Oli Pettigrew announced the top 4 ladies who had the best eco videos, a special Miss Earth project that sheds light on the candidates' various environmental projects. Best Eco Video award went to the USA. The swimsuit competition came next, with all of the top 16 walking the stage in swimsuits by Filipino designer Ricky Abad. 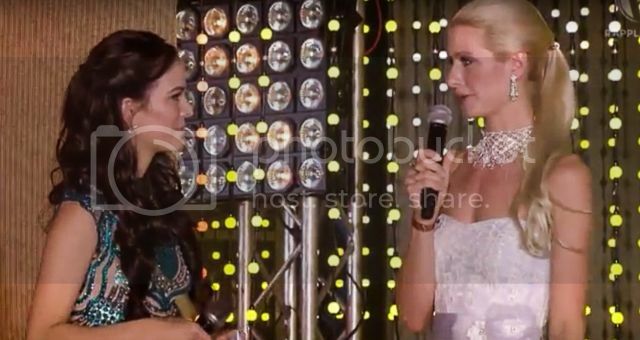 First Miss Earth winner Catharina Svensson was among many other previous Miss Earth queens in the audience, and she gave the ladies some sound advice: to stay focused on the noble cause. A performance of "Here I Am" from Eric Papilaya followed. This was followed by the evening gown portion, starring the top 16. The question-and-answer portion followed. Here are a few pictures from the segment, which included a tough question about what Miss USA might say to US President Obama about climate change, Miss Australia's environmental hero, and more. After this, Jamie Herrell took one last turn onstage as Miss Earth. 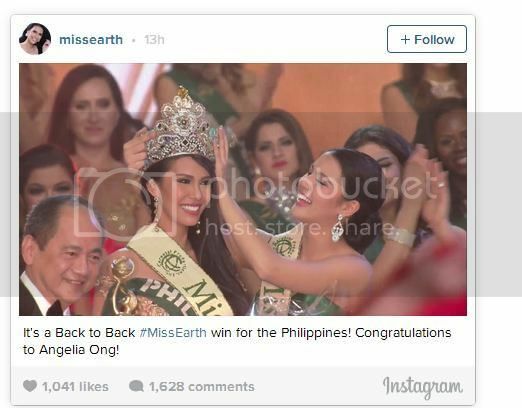 Angelia Ong, who represented the Philippines, was crowned 2015 Miss Earth on Sunday. Ong, who beat more than 80 other national delegates, succeeded Filipina beauty queen Jamie Herrel, who earned the title in 2014. She is the country's third representative to win the crown. The country's first Miss Earth Karla Henry won the crown in 2008. MANILA – This weekend, Angelia Ong will try to nab the Philippines’ first-ever back-to-back win in the Miss Earth pageant. Her predecessor, Jamie Herrell, won the Miss Earth title in 2014. “I know I have the right mind… and I would be the right channel to inspire and educate people on how they can help preserve and protect the environment in their own simple way,” said Ong, a marketing management student. As we count down the days before Miss Earth 2015 set at Marx Halle in Vienna, Austria on December 5 (December 6 in Manila), let’s take a look at some of the stunning photos of Ong on her social media pages. Truth Revealed: Philippines Disqualified In International Beauty Pageants!? After the Philippines had dominated the International Beauty Pageants one institution bans the Filipinas from joining other competitions. It will be effective for the next two years after the winning streak of the Philippines in Miss Earth and bagging home the title Miss Globe. In Thailand, the representative of the Philippines Ms. Annalie Forbes bagged home the fourth-place in the Miss Grand International Beauty Pageant. Due to that, the Association of Beauty Pageant Franchise Holders (ABPFH) is banning the Philippines from the big pageants for the next two years. They claim that the Philippines have already showcased how beautiful and witty the Filipinas are and that it is time to let the other countries win. “The world already knows how beautiful and talented Filipinas are.” according to ABPFH. However, the AdoboChronicles website that released this news about the disqualification of Philippines in the International Beauty Pageant is reported to be a satirical site. There are no evidence that the disqualification is true. UPDATED – The ban on Filipina candidates to International beauty competitions has been extended for another two years, following the recent crowning of two Filipinas as ‘Miss Globe’ (Ann Lorraine Colis) and ‘Miss Earth’ (Angela Ong). Bangkok, Thailand – After today’s fourth-place finish of Annalie Forbes, the Philippines’ representative to the Miss Grand International Beauty Pageant in Bangkok, Thailand, the Association of Beauty Pageant Franchise Holders (ABPFH) has banned the Philippines from future international beauty competitions, citing “enormous advantage” by Filipina candidates in practically all pageants this year. The disqualification will be in effect for two years. The Philippines holds the distinction of having won the title in all major beauty competitions like Miss Universe, Miss World and Miss International. Additionally, every new international beauty competition has seen a Filipina winning the title or placing in the top 5. Earlier this year, Mutya Datul won the 2013 Miss Supranational Pageant. Forbes is the fourth Filipino to make it to the top 5 in competitions this year. Megan Young, of course, bagged the 2013 Miss World title this year, the first-ever for the Philippines. Before Young, Evangeline Pascual reached the finals and was first runner-up in 1973 while Ruffa Gutierrez was second runner-up in 1993. Ariella Arida, the country’s bet in the 2013 Miss Universe Pageant in Moscow, Russia, placed fourth. Other Filipina beauties who have won international titles include Gloria Diaz and Margie Moran (Miss Universe) and Gemma Cruz, Mimilanie Marquez, Aurora Pijuan, and Precious Lara Quigaman (Miss International). Karla Henry won the Miss Earth title in 2008. In 2010, 2011 and 2012, the Philippines’ Venus Raj, Shamcey Supsup and Janine Tugonon were all in the top 5 in the Miss Universe competition.